Heat a large pot or Dutch oven over medium-high heat and add the olive oil. Add the onion, carrots, celery, garlic, marjoram, and bay leaves and cook until starting to soften, about 10 minutes. Remove the meat from the brine and rinse it well. Set the meat on top of the vegetables and add water to just cover the meat. Bring to a boil skimming any foam that surfaces. Reduce the heat to a simmer, place the lid on the pot, and cook for 15 minutes. Add the cabbage pieces, cover, and put it into the oven; cook for 3 hours. Remove the meat, cover it with foil, and let it rest for 20 minutes. 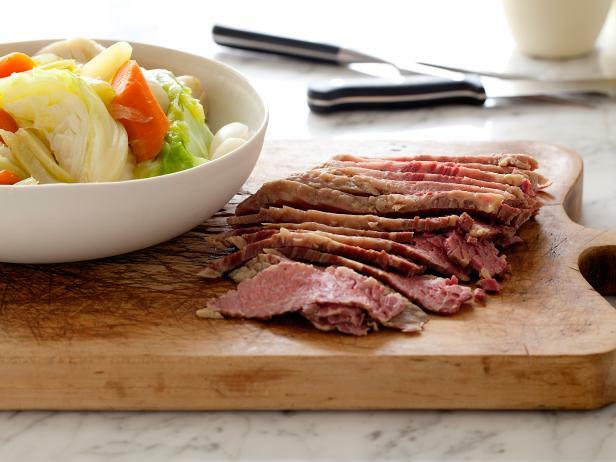 Cut the fat off the corned beef, slice the meat against the grain, and serve it in shallow bowls with the cabbage wedges, some cooking liquid, and the Herbed Root Vegetables. Herb Butter:Put the olive oil and butter into a large pot over medium-high heat. Add the vegetables and toss to coat them well with the fat; season with salt and pepper. Add 1 cup water and bring to a boil. Lower the heat to a simmer, cover the pot, and cook until the vegetables are tender, about 20 minutes. Summer is upon us and one of my favorite dishes to make is a Caprese Salad. We are lucky enough to grow tomatoes and basil in our back yard so this is really easy to make. Paired up with a nice cold glass of white wine this makes for a great appetizer or even a main course. I enjoy eating this around sunset and sitting in my backyard with my husband enjoying good food, wine and great conversation. In a large Dutch oven over medium heat, heat olive oil. Add onion and bell peppers and season with salt and pepper. Cook until almost tender, about 5 minutes. Stir in chicken and season with salt, pepper, and oregano. Cook until the chicken is golden, about 5 minutes, then stir in andouille sausage, garlic, and tomato paste and cook until fragrant, about 1 minute more. Add chicken broth, crushed tomatoes, rice and Old Bay seasoning. Reduce heat to medium low, cover with a tight fitting lid, and cook until the rice is tender and the liquid is almost absorbed, about 20 minutes. Add the shrimp to the pot and cook until the shrimp is pink and cooked through, three to five minutes. Stir in green onions just before serving. Wash chicken and blot dry with paper towels. Mix the oregano, cumin, white pepper and vinegar in large bowl. Add chicken, turning the pieces to cover with the mixture. Let marinate at least 15-30 minutes. Heat oil in large casserole brown the chicken pieces all over about 2 minutes per side. Transfer chick to platter and pour out all fat but 2 tablespoon. To Make Sofrito: Add onion, bell pepper, and the garlic to the oil in a casserole and cook over medium heat until soft for about 1-2 minutes, do not brown. Add tomato and cook for one more minute. 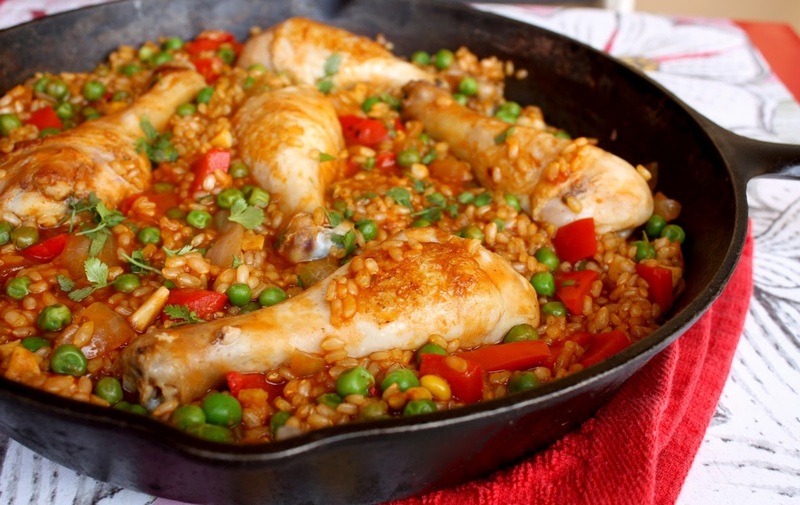 Fold chicken into the sofrito in the casserole and cook for 2 more minutes. Add wine, and beer, saffron or annetto seeds, tomato sauce, and salt and pepper. Add raisins and sliced olives and simmer for 30 minutes covered. Bring to a boil and add the Arborio or Valencia rice bring to a boil and simmer for 20-25 minutes until rice is tender. Before it is done add 1/2 of the petit pois and pimientos, garnish with the rest. Serve with a green salad French bread and a Sauvignon Blanc. Picadillo is Cuban-style hash. It's ground beef with tomato, green pepper, green olives and plenty of garlic.